Tenerife offers a plethora of adventures to explore. Whether it be adventure sports, golf, fine dining, history and culture or just plain relaxation, there's something for everyone on Tenerife. Please enjoy our video gallery to get a taste of what you can look forward to on your trip. Loro Parque is one of the most popular attractions on the island is this wildlife park in Puerto de La Cruz. Set on a hillside overlooking the Costa Adeje, this little slice of Thailand looms large among those looking for gravity-defying, adrenaline-rushing, white-knuckle fun. 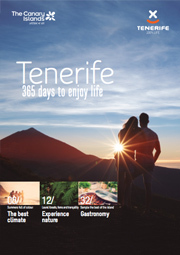 Tenerife Select is the brand encompassing the Island’s most exclusive tourism attractions, offering short breaks for any time of the year: the best choice for those wishing to pamper themselves and enjoy a unique experience. Welcome to the Island of Tenerife, the largest of the Canary Islands. Eating in Tenerife is a fantastic experience filled with fresh fish, savory mojo sauce, and creamy desserts. The crystal-clear waters of the Atlantic Ocean around Tenerife and the Canary Islands are filled with a rich diversity of marine life, making for an undersea paradise. Above the waves, windsurfing, kite surfing, surfing, kayaking, deep-sea fishing and sailboat trips are both for experts & beginners. Discover new sensations, live illusions and daydreams. It's time to rejuvenate in Tenerife. If you love discovering new experiences when traveling, Tenerife is the destination you've been looking for. Explore this elegant luxury island resort, surrounded by magnificent architecture and contemporary art. Don't settle for second best when booking your vacation- discover Hard Rock Hotel, Tenerife. An oasis of luxury in Tenerife, Canary Islands, where exclusivity is apparent in every detail. Discover paradise in the Canary Islands with suites and villas decorated to perfection that offer stunning views. Experience the best Tenerife, Canary Islands, has to offer, while taking in breathtaking views. With a multitude of adventure sports to choose from, Tenerife, part of the Canary Islands, is an adrenaline junkie's dream. Fulfill your dreams with our romantic packages on Tenerife, part of the Canary Islands. Experience some of the world's best golfing on courses unlike any other on Tenerife, Canary Islands. Brought to you by Expedia, this travel guide will highlight what you can expect to experience on your trip to Tenerife.